When I first began seriously studying the idea of carefully selected groups of native plant species growing and intermingling together I referred to the result as ‘recombinant urban corollaries for regional ecological communities.’ Later, I decided that this was not really descriptive because the main goal of the process is not to create complex new plant communities, but rather to balance ecology with environmental performance and, importantly, aesthetics and human use. I then thought of calling them ‘guilds’ but the term is overly tied to permaculture and sustainable farm practices—the kinds of practices taught to the earliest pilgrim immigrants to America by the native Indians such as growing corn, squash, and beans together. The Lady Bird Johnson Wildflower Center prefers to call native groups of plants ‘assemblages.’ This works, but is not really descriptive as any group of plants growing either intermingled or in discrete patterns of monocultures can be called an assemblage. I settled on polycultures to distinguish the practice from single species of monocultures. ‘Polyculture’ also has a strong history in agriculture but is redefined here within an ornamental horticulture context. more resistance to pathogens . A detailed discussion of the benefits of polycultures will be the subject of a future post. Native turf mixes are appropriate for the regions they were designed for and become less ecologically appropriate farther away from the source of production. For example, S&S Seeds makes a variety of native lawn mixes that are only designed for and appropriate to the state of California. It should be noted that these seed mixes are not the same thing as ‘no mow’ blends which can be either native or exotic introduced species, or even invasive plants. Prairie Nursery, High Country Gardens, Wildflower Farm and others manufacture and market non-native low mow turf mixes more in keeping with the ethos of saving water and other resources than with ecological considerations. Creating seed mixes with regionally native plants and only marketing them to the regions where they are produced is the only way that native turf polycultures will make their way into appropriate regions where the plants are actually indigenous. A good example of a mix that uses native species, called HABITURF®, was developed at the Lady Bird Johnson Wildflower Center at The University of Texas at Austin. HABITURF® is a blend of Bouteloua dactyloides (Buffalograss), Bouteloua gracilis (Blue Grama), Hilaria belangeri (Curly-Mesquite), and others. This turf blend is designed to ‘read’ as a fine bladed monoculture despite the diversity of species. 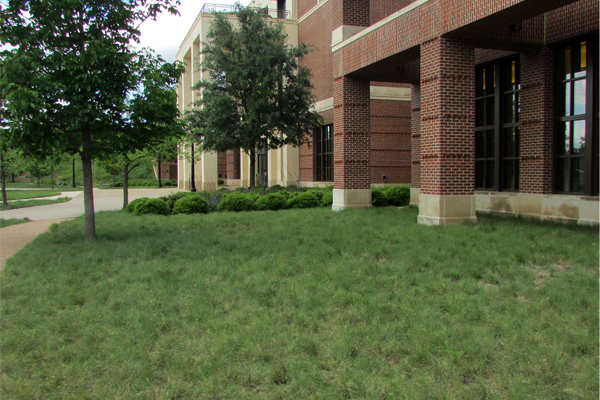 This grass mix, selected for the turf mix at the Bush Center, has been aesthetically qualified to blend together by selecting for height, color, and texture, as well as for horticultural considerations and turf-like growth patterns. The diversity of species helps mitigate the problems associated with each individual species such as poor density, susceptibility to invasion by weeds, and a tendency toward dormancy when under stress (Buffalograss), and slow spreading and color issues (Blue Grama). HABITURF® can be left un-mown, in which case it will have a succession of seed heads that may or may not be desirable, or can be mown every two to four weeks for a more traditional and formal lawn appearance. The height to maintain the HABITURF® at the Bush Center is a big topic of discussion between people who like a more traditional lawn look and people who enjoy a short grass polyculture with plants expressing their morphology as they would in the wild. At the present time, the online brochure that describes HABITURF® shows a map of all of Texas, Oklahoma, New Mexico, and Arizona as the appropriate region for the mix . 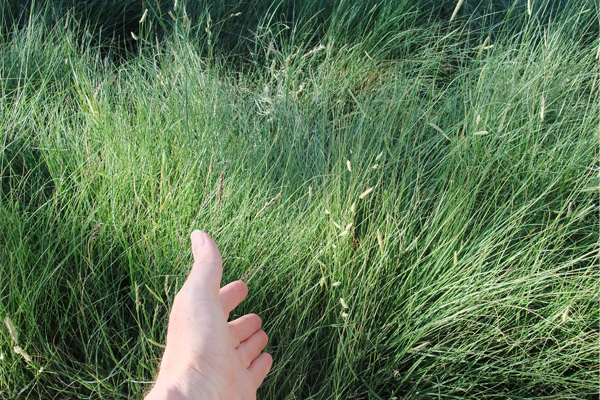 However, two of the three main grasses in HABITURF® are not native to East Texas (Curly Mesquite and Blue Grama) and even the popular Buffalograss is only rarely found in Arizona and is sometimes considered an invasive species that is changing the native ecosystems there. Landscape architects should consult BONAP (see part 4 of this series) to test the regional appropriateness of any seed mix specified. 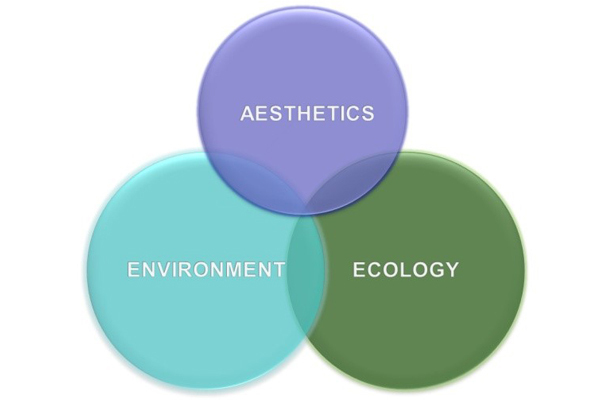 Figure 4 represents the balance achieved with the HABITURF® polyculture at the Bush Center. Human use and aesthetics have been balanced with a more diverse palette of plants that enhances both the ecological services and the biological diversity of the planting design. Native turf polycultures require less water, fertilizer, and maintenance than many monoculture turf species and provide a much better balance of aesthetics, environment, and ecology. 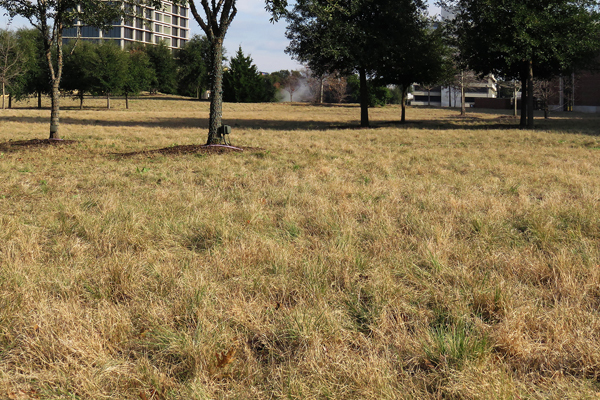 Native grass mixes are an important beginning for the range of polycultures that must be constituted for the myriad horticultural niches and varying aesthetic requirements typically needed for planting design in metropolitan developments. 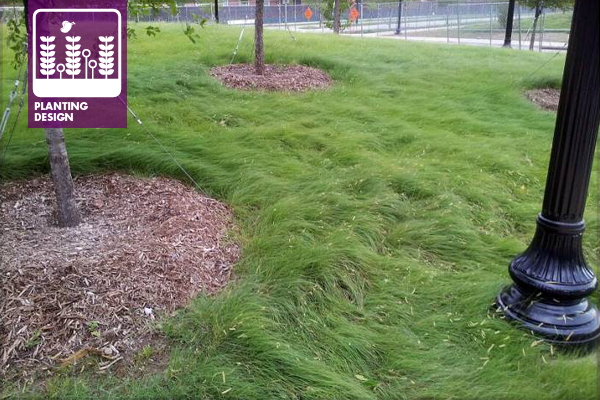 Landscape architects can take an incremental approach to adoption of this important innovation. Next month’s post will discuss strategies I am using to gradually develop a palette of workable aesthetically qualified native polycultures from the native plants I already know and use. The Lady Bird Johnson Wildflower Center. Habiturf, the Ecological Lawn. Accessed 1-2016. See also: Ladybird Johnson Wildflower Center’s Consulting Portfolio webpage for a picture of mowed HABITURF® on the UT-Austin campus.